Description: Learn how to contact print with rusty objects and create your own rich, earthy images. This class will appeal to your inner artist and scientist by introducing the simple formulas and experimental processes for a unique mark-making experience that works beautifully on both paper and textiles. Lauri Jones is an artist who creates works on paper, artist books, prints and intricately stitched textile works. 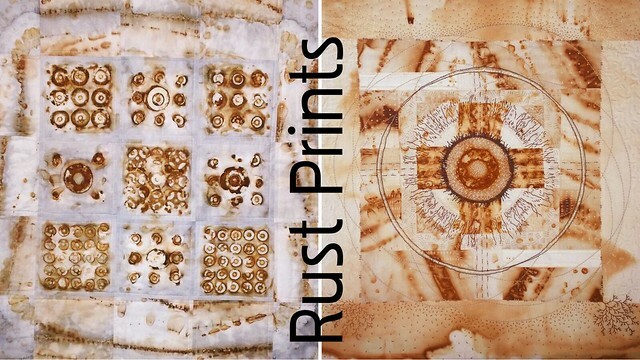 Rust printing is her on-going obsession, although quilting and embroidery have monopolized her hands and thoughts for the past few years. A native of Allentown, PA, Lauri graduated from RISD in 1990 with a degree in Graphic Design. In 2009 she received a Master of Arts in Teaching from Savannah College of Art and Design. Currently she teaches art and design thinking at The Westminster Schools in Atlanta, GA. You'll find her on Instagram at laurijonesartist. Experience Level: Beginner - no experience necessary. Supply Fee: $2 payable to the instructor at the beginning of class for pre-rusted items. If you have trouble registering or paying (Safari users!) or if you are concerned that this website does not have an https address, please use the following direct link for registration and payment: https://sefaa.secure.force.com/Programs/CnP_PaaS_EVT__ExternalRegistrationPage?event_id=a0u0V00000mAzMeQAK. If you prefer to register and pay by mail, click here to print a registration form. Questions? Please email info@fiberartsalliance.org or call 678-235-4328. Sorry, this class has been canceled due to low enrollment. Please visit SEFAA's website for upcoming classes, workshops, exhibitions, and events. You can also sign up for SEFAA's monthly E-newsletter to receive news and information directly in your inbox. Sorry, this class is sold out and registration for it is closed. Please email if you would like to be added to the waiting list.